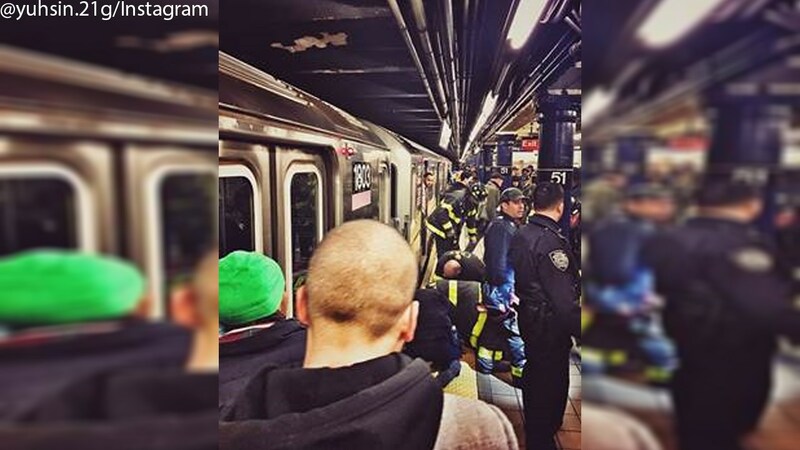 MIDTOWN, Manhattan (WABC) -- A 25-year-old woman is in critical condition after she was struck by a train inside a Manhattan subway station on Wednesday afternoon. Police say the woman was at the Lexington Avenue and East 51st Street station waiting for a southbound 6 train shortly before 1:30 p.m.
That's when she was seen fainting close to the platform edge, followed by her falling onto the track and then being hit by a train. The woman was rushed to Bellevue Hospital where she remains in critical condition as of Wednesday night. Regular service resumed with some delays approximately an hour after the incident.